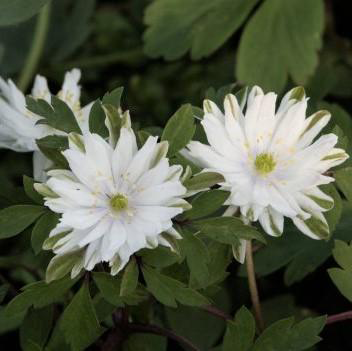 Anemone nemorosa commonly known as Wood anemone is an early-spring flowering plant in the buttercup family Ranunculaceae and like other members; Anemones contain the irritating, acrid oil protoanemonin and are not edible. The plant is native to northern and central Europe including Great Britain, but not to areas along the Mediterranean. 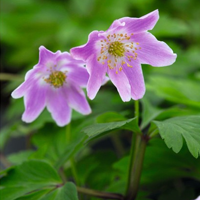 Anemone comes from Greek and literally means ‘daughter of the wind’, and one of the old common names for this species is Windflower. The specific epithet nemorosa is derived from the Latin nemus meaning ‘forest’ – a reference to the woodland habitat in which these flowers grow. Native Americans used this plant to make a medicine for treating wounds. Today, it is often grown in native plant gardens and naturalized around ponds and streams. It offers attractive foliage and is a beautiful early bloomer but it is also an aggressive spreader. 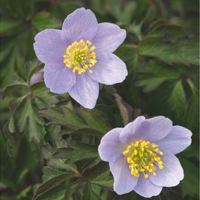 Some of the popular common names of the plant are thimbleweed, smell smock, smell fox (because of the musky smell of the leaves), American wood anemone, blodyn y gwynt (windflower, in Welsh), Bow bells, bread and cheese and cider, Candlemas caps, chimney smocks, crowfoot, drops of snow, Easter flower, evening twilight, fairies’ windflower, flower of death, granny’s nightcap, granny-thread-the-needle, jack o’ lantern, lady’s milk-cans, lady’s nightcap, lady’s petticoat, lady’s purse, lady’s shimmy, milkmaids, moggie nightgown, Moll o’ the woods, moonflower, Nancy, nemony, nightcaps, old woman’s nest, shame-faced maiden, shoes and slippers, silver bells, snake flower, snakes and adders, snake’s eyes, soldiers, soldier’s buttons, Star-of-Bethlehem, white soldiers, wild jessamine, wind plant, wood crowfoot, wood anemone, moonflower, wind-flower, wood windflower and Grandmother’s Nightcap. 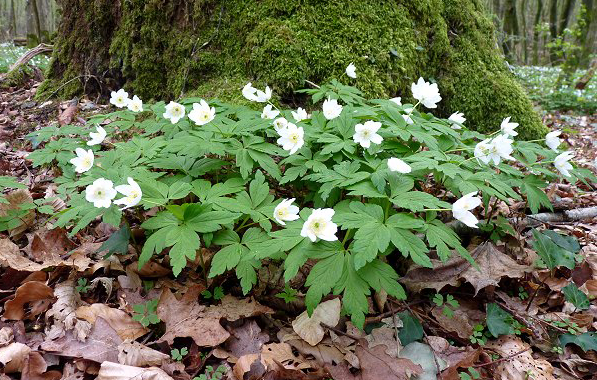 Wood anemone is an early-spring rhizomatous herbaceous perennial, flowering plant that grows about 30 centimeters (12 in) tall. 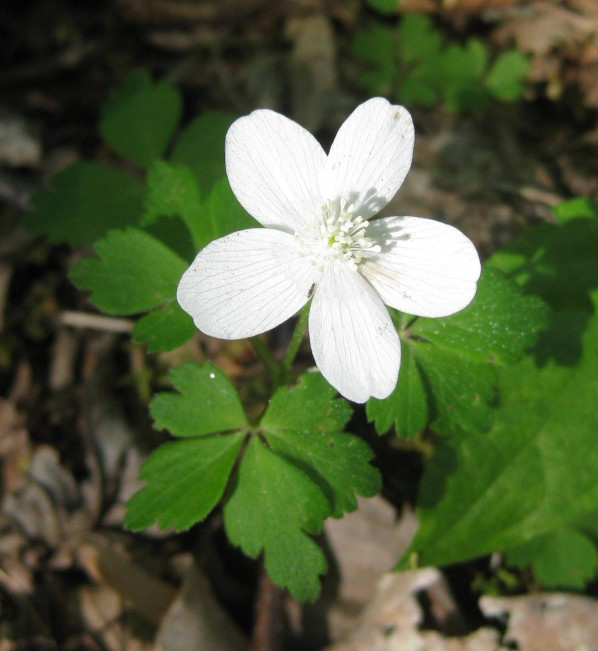 The plant is found growing in deciduous forests, forest edges, clearing, forest steppe zones, young broad-leaved forests, coppices, grazing lands, swamps, banks, ditch banks, under Pteridium, on hedge banks, in healthy grassland, on open moorland, in scree and on limestone pavement. 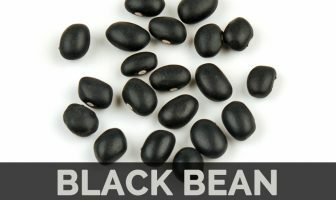 The plant is easily grown in moist, humus-rich, fertile, slightly acidic and well-drained loam soil. The plant has a long, tough, creeping root-stock that runs just below the surface; it is the quick growth of this root-stock that causes the plant to spread so rapidly, forming large colonies in the moist soil of wood and thicket. 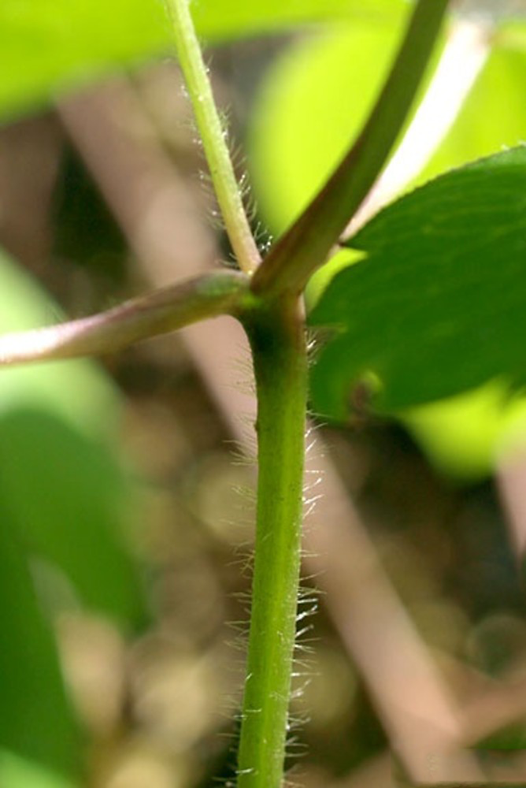 Stem is about 10-25 cm, simple, slender, erect, and leafless, except at the top, where it bears a whorl of three-petiolate, three-parted floral leaves, and a solitary, small, peduncled, white, or purplish flower. 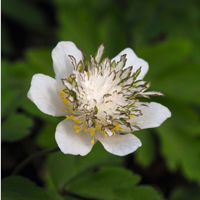 Leaves of the wood anemone are simple but are so deeply divided that they have the appearance of a palmate leaf. The leaf is occasionally termed as trifoliate. 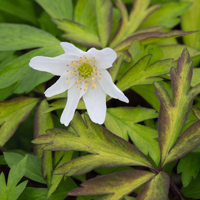 Leaves have a distinctive smell, often described as musky – which may account for one of the wood anemone’s alternative names “smell fox”. There is a whorl of leaves just below the flower, whilst others arise from ground level on long stalks. Flowers are solitary, held above the foliage on short stems, with a whorl of three palmate or palmately-lobed leaves like bracts beneath. The flowers are 2 centimeters (0.8 in) diameter, with six or seven (and on rare occasions eight to ten) tepals (petal-like segments) with many stamens. In the wild the flowers are usually white but may be pinkish, lilac or blue, and often have a darker tint on the backs of the tepals. Flowering normally occurs from March to May. 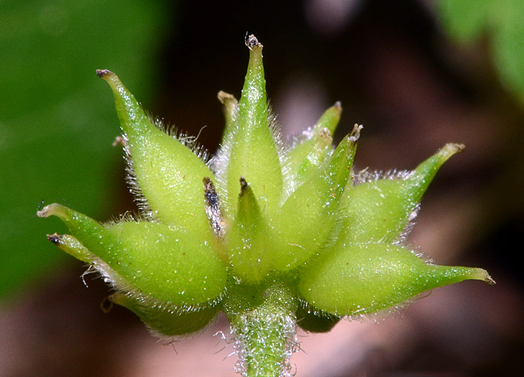 Flowers are followed by elliptic, hairy, short-tipped, 4–5 mm (0.15–0.2 in.) long achene. The fruit when it forms is made up of many achenes (an achene is a one seeded fruit). 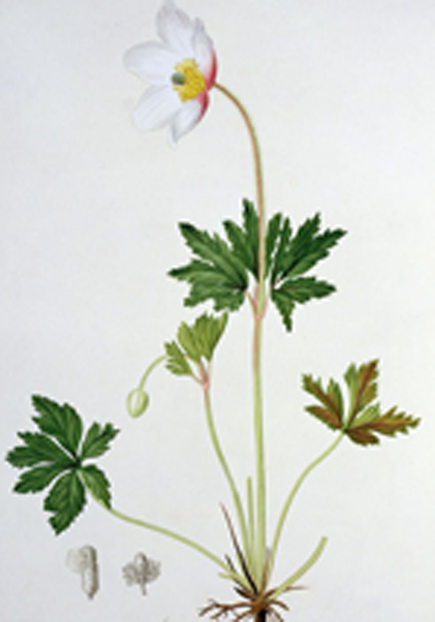 For the Ancient Egyptians the wood anemone was a symbol of sickness, and it is still called the “flower of death” by the Chinese. 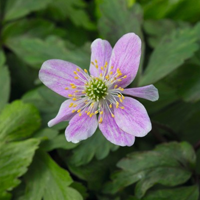 Greek legend says that Anemos, the wind, sent his namesakes, the anemones, in the earliest spring days as the heralds of his coming. 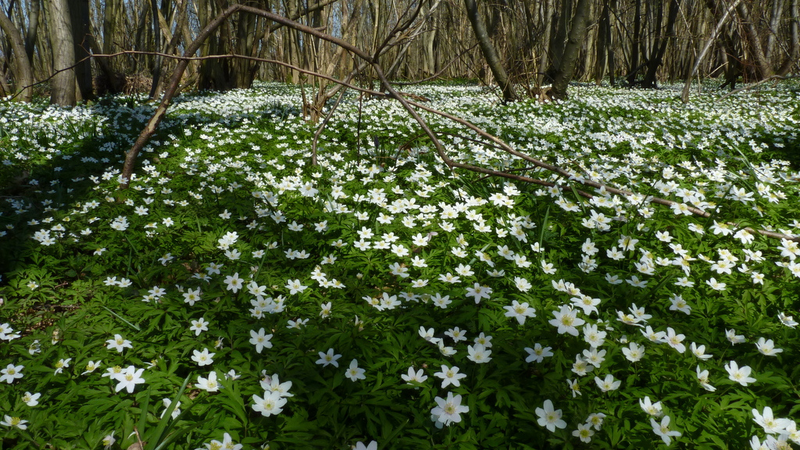 The Romans observed the first wood anemones they picked from the wild as charms against fever. In the first century CE Dioscorides recommended the plant to be used in external treatments for eye inflammation and ulcers. It is considered as an old cultivar from the Vienna woods. It has creamy-yellow flowers that appear in mid-April and which continue to the end of June. The new foliage has a red sheen. The plant has attractive, deeply cut leaves and reddish stems that hold the large flowers above the foliage. 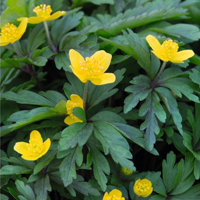 The flowers are a lustrous yellow, reminiscent of buttercups. It flowers in April and May. 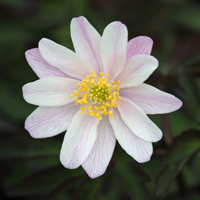 Like many pink-flowered forms, the flowers open white then develop a pink tinge before finishing a purple-pink. 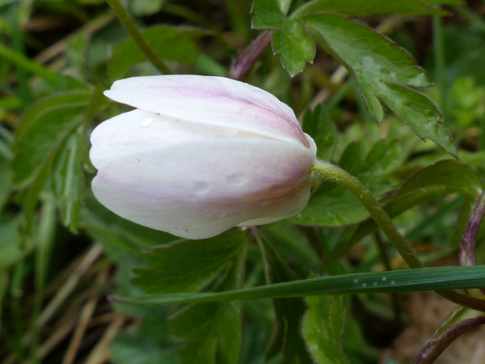 It is also one of the earliest to flower. The plant often produces pink flowers, this selection has been named because the flowers are much darker than most. The plant is slow to develop and in ideal conditions reaches about 10cm tall. The plant is one that EA Bowles wrote about and is named for the gardener William Robinson. The flowers are pale, washed-out, lavender blue. 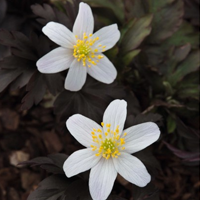 It is the recent introduction from the Netherlands with almost-black foliage that shows off the brightness of the flowers. Despite the dark foliage it produces lots of flowers. 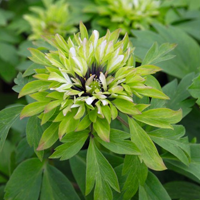 The plant is found as a seedling a decade ago by plantsman Michael Mitchell, and named after his Yorkshire nursery. Michael selected it for its open flowers and neat habit. It is a vigorous cultivar that supposedly flowers much earlier than others, with mint-green and white bracts and white sepals. The same plant is also being sold as ‘Ploeger de Bilt’. The name refers to the mountain in Austria where this cultivar was lately found. The sepals are finely cut, almost filigree, with a pale-pink shine on the white background. 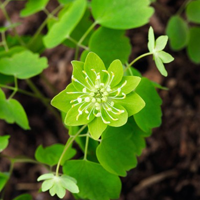 The curious green flowers nestle in the plant’s foliage and are easy to miss. 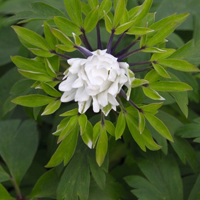 Narrow, white petals develop into the shape of a child’s pinwheel. 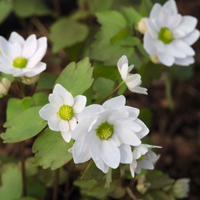 Introduced by Fernwood Nursery in Maine, USA, these elegant flowers look delicate but are tough enough to stand up to wind and rain during the blustery weather of April and May. 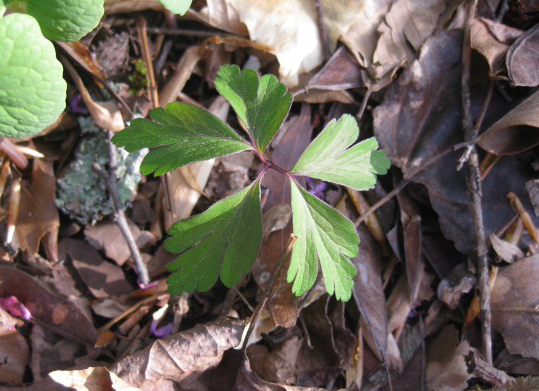 Seedlings with dark foliage appear frequently in the wild and several nurseries sell forms with dark leaves. In general the flowers are simple, pure white, typical of the species. 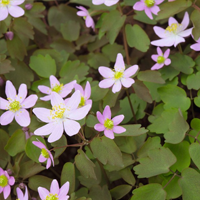 It is a delicate form with double, pink flowers, resembling a miniature pincushion. The plant is found in a graveyard in Minnesota. It is slow-growing so not often sold. It is a vigorous cultivar that seems to spread more quickly than most others. 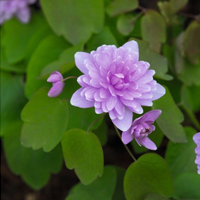 The flower has a slightly nodding habit, which allows you to see the pink reverse of the flower. The original plant was found in the Picos de Europa Mountains in Spain by galanthophile Richard Nutt. 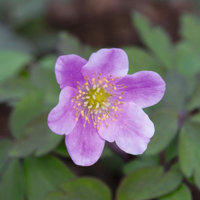 The foliage has a dark-purple sheen and the reverse of the petals is deep pink. The plant was found by Brian Dockerill, a champion of variegated plants, and named after his village in Wales. The new foliage has a rusty-red edge and develops to olive green. Pink-flowered forms are common in woodlands in central England, particularly Berkshire, where this one was found. The flowers have a lilac tinge when they open and fade to pink. 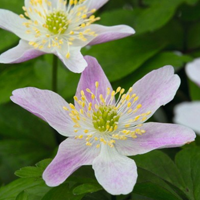 It is an unusual and rare cultivar, with a curious central boss of nectaries and stamens that have become petaloid, enclosed by white sepals edged in dark green, giving it a two-tone effect. Despite the awfulness of the First World War in France, plantsman Frank Waley was able to botanise and found this cultivar in France. It is one of the most dynamic of the family. 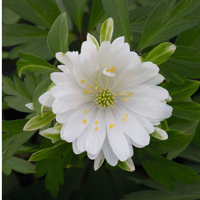 It is a beautiful and robust cultivar with flowers that have a central white cushion made up of stamens that have become petaloid, sitting on a corona of white petals. 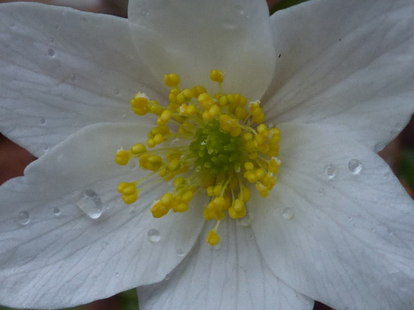 No wood anemone could be called flamboyant but this one gets close. As its name suggests, the flower is a combination of bracts, which form an eye-catching ruff, and sepals. It is a beautiful but unpredictable plant, which in some years has a pronounced blue center when the flower opens, in other years it is very faint. The blue always ultimately fades to white. It is a curious flower where almost all the sepals, nectaries, tepals and bracts have transformed to become leaf-like. 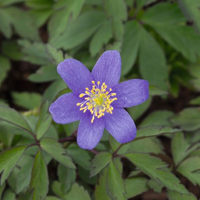 Although the flowers are variable, they always have a dark-purple stain in the center. It is a floriferous cultivar from Ireland with a neat, compact habit and large, lavender-blue flowers. This was the favored cultivar of the renowned plantsman Christopher Lloyd. 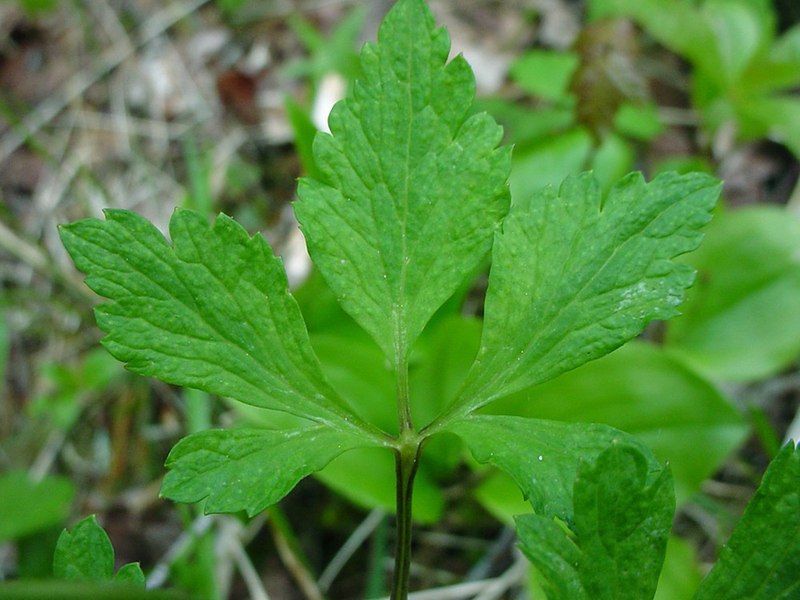 Plant is occasionally used externally as a counter-irritant in the treatment of rheumatism. Various parts of this herb used to be suggested for a variety of complaints such as headaches and gout, though the plant is virtually not used nowadays. Homeopathic remedy has been made from the leaves. It has been recommended in amaurosis and other diseases of the eye, secondary syphilis, cutaneous diseases, and whooping-cough, in doses of 1 or 2 grains daily. 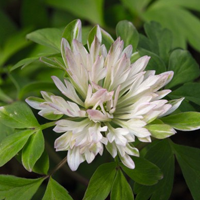 Various parts of this herb used to be recommended for a variety of complaints such as headaches, gout and rheumatism. It provokes menses mightily as well as lethargy, headaches, leprosy, ulcers and eye inflammations. 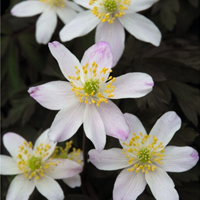 Flowers of Anemone nemorosa follow the sun, moving their faces from east to west during the course of a day. In China they are referred to as the ‘flower of death’, perhaps due to their poisonous qualities. 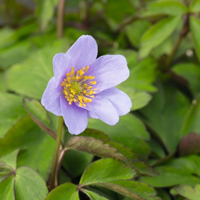 Romans however considered the flowers a ‘lucky charm’ and would pick the first flowering wood anemone each year to ward off fever. 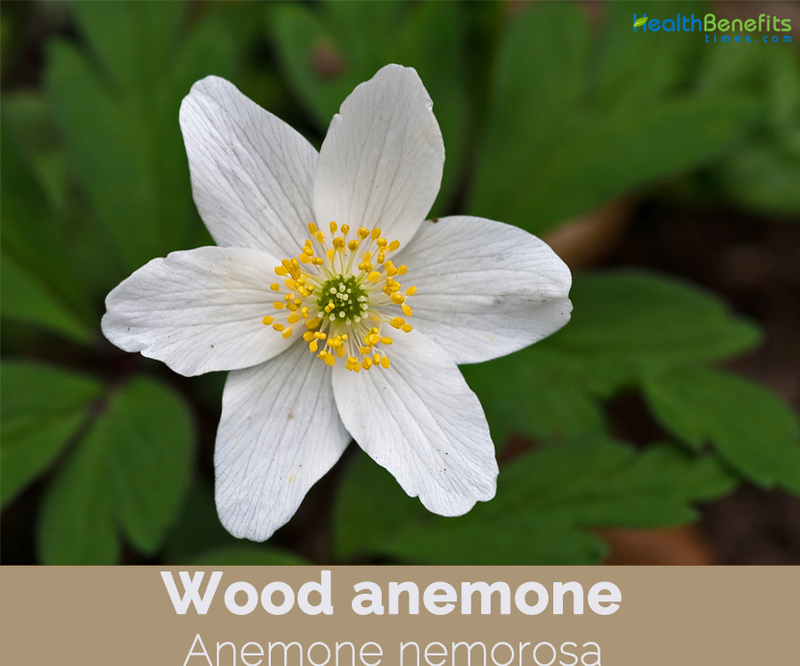 All parts of this plant contain protoanemonin, irritating acrid oil that can cause severe topical and gastrointestinal irritation, it is unstable and changes into harmless anemonin when plants are dried or heated. Can be a dangerous and powerful depressant of the central nervous system and heart. 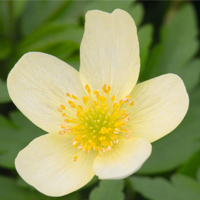 Infusion of Wood anemone should not be used by pregnant, during lactation and is not recommended at kidney inflammation. Flower The flowers are 2 centimeters (0.8 in) diameter, with six or seven (and on rare occasions eight to ten) tepals (petal-like segments) with many stamens. 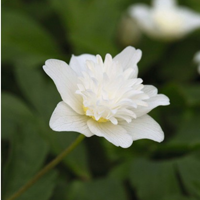 Anemone intermedia Winkl. ex Pritz. 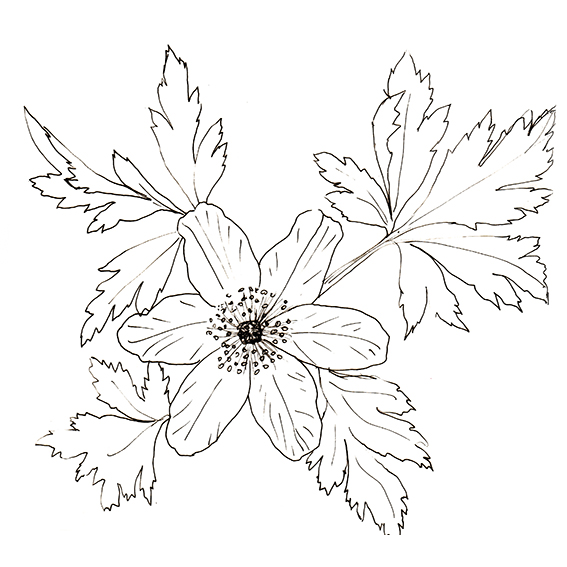 Anemone nemorosa f. vulgaris Ulbr. 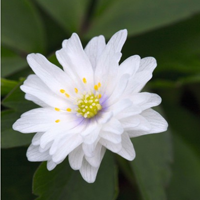 Anemone nemorosa var. nemorosa L.
Anemone pentaphylla Hook. ex Pritz.